Looks like Windows mobile, but is not Windows Mobile. Cue the new Windows 8 screen. Has Windows jumped on the bandwagon made of Ugly sticks (there was a free seat next to Ubuntu’s “Unity”, a little bird said) or do you like the slate layout? Regardless, users will be able to opt out for a slightly more er, traditional, interface in the coming version which is always a relief. 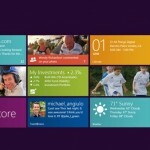 Windows 8 appears consumer-oriented, optimized for touch screen devices and app-focused. Only customer responses will tell us if this will go in the path of the Zune, or revolutionize the way we see the PC.